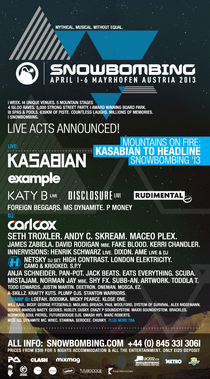 Kasabian are ready to set fire to the après-ski celebrations as they prepare to headline the Snowbombing festival on 1-6 April, 2013. Acclaimed as one of the best live acts on the planet, the band will be leaving behind the stadiums and arenas they’re accustomed to in favour of snow-capped mountain peaks. The Leicestershire lads will not only be appearing at the apex of the festival’s line up, but will also be scaling the hillsides to another summit as they perform a second and completely exclusive intimate show 6000 feet up on the powder-topped crest of a mountain.